Model of UV-B sensing by UVR8, a heme-free photoreceptor. 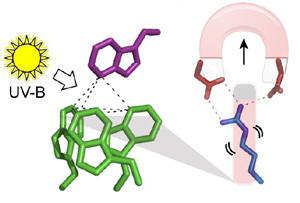 Researchers from Scripps Research Institute and the University of Glasgow have published a detailed molecular model of how UVR8, a unique heme-free plant photoreceptor, senses UV-B light via an intricate interacting mesh of Tryptophan residues positioned at the UVR8 dimer interface which ultimately results in the disruption of a salt bridge and dissociation of the UVR8 dimer. The recently identified plant photoreceptor UVR8 triggers regulatory changes in gene expression in response to ultraviolet-B (UV-B) light via an unknown mechanism. Here, crystallographic and solution structures of the UVR8 homodimer, together with mutagenesis and far-UV circular dichroism spectroscopy, reveal its mechanisms for UV-B perception and signal transduction. β-propeller subunits form a remarkable, tryptophan-dominated, dimer interface stitched together by a complex salt-bridge network. Salt-bridging arginines flank the excitonically coupled cross-dimer tryptophan “pyramid” responsible for UV-B sensing. Photoreception reversibly disrupts salt bridges, triggering dimer dissociation and signal initiation. Mutation of a single tryptophan to phenylalanine retunes the photoreceptor to detect UV-C wavelengths. Our analyses establish how UVR8 functions as a photoreceptor without a prosthetic chromophore to promote plant development and survival in sunlight.